Is the AVR market really making progress, or is it just starting to reach a point of stability? We don’t know which one it is, neither do we know which one it should be. Nonetheless, our topic of discussion today is Denon’s new AVR X1400H. Before we get into that, we believe that the AVR market has reached some sort of saturation point where if you invest into a new AVR today, you probably won’t regret it next year because there will be no new features that you’re missing out on. Why did we mention that? Let me tell you. While Denon claims that the AVR X1400H is a new addition to their already invincible range of AV receivers, it can be simply stated that this year’s version is quite similar to its forebear. Renaming a few legacy inputs and changing the appearance of front-panel controls was not the sort of upgrade we were hoping for. However, an extremely noteworthy feature of this year’s AVR X1400H is definitely the new IMAX Enhanced support. Denon works tirelessly to ensure the unbeatable performance of all its AV receivers. Similarly, the AVR X1400H is strategically designed to work as a typical home-theatre system with a single video signal receiver. Producing clear dynamic patterns and slightly lightening the tonal picture, Denon has worked hard to create a model that satisfies the need of any ordinary homeowner. Functions such as a digital player, internet radio, network audio player and an amplifier of class D are all included in the AVR X1500H. Additionally, there are many built-in decoders such as the DTS Neural:X, DTS-HD Master Audio, DTS:X, Dolby Atmos, Dolby Digital Plus, Dolby Surround and Dolby True HD. 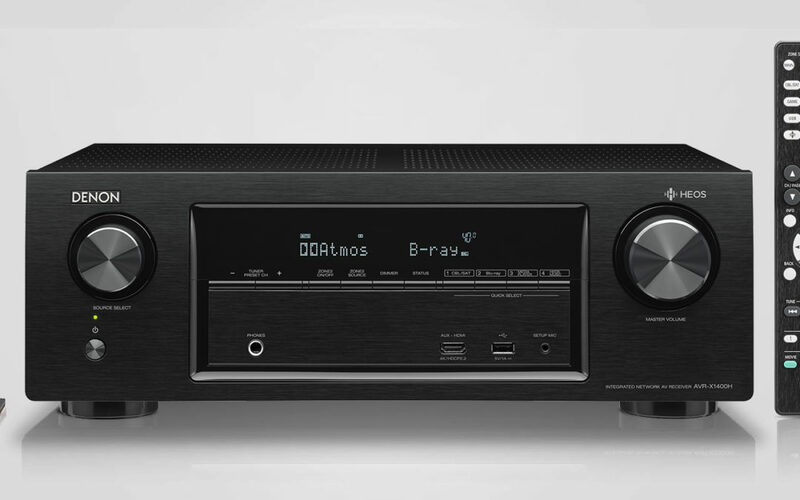 Easy to connect and initiate, the Denon AVR X1400H has Audyssey Room Correction that allows users to tune the receiver according to their specific needs. The best part about this is that it does not consume the drive entirely and successfully adjusts the sound according to the size of the room and position of each specific speaker. Similar to all other Denon receivers in the past, the AVR X1400H has a black metal case and front panels designed in the trademark Denon design. As compared to other models released in 2018, the AVR X1400H has a glossy frame around the central panel which sets it apart from the crowd. 2 rotary knobs of unique diameters are placed on this panel which allow users to make adjustments to source and volume. While the upper half of the control panel is equipped with a basic display, the lower half has the HDMI input and a USB port. Denon’s policy of updating its products with new features added through internet firmware updates. The user interface can be unreliable and confusing for most people. Even the most basic and essential functions were quite difficult to find.